The surface pattern on this pedestal rock is honeycomb weathering, caused by salt crystallization. 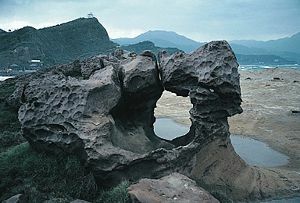 This formation was observed at Yehliu, Taiwan. Weathering is the process of disintegration of rocks and soils and the minerals they contain through direct or indirect contact with the atmosphere. The weathering of an area occurs "without movement." By contrast, erosion involves the movement and disintegration of rocks and minerals by processes such as the flow of water, wind, or ice. There are two main types of weathering: mechanical (or physical) and chemical. Mechanical weathering involves the breakdown of rocks and soils through direct contact with atmospheric conditions such as heat, water, ice, and pressure. Chemical weathering involves the direct effect of atmospheric chemicals or biologically produced chemicals (also called biological weathering). Chemical weathering alters the chemical composition of the parent material, but mechanical weathering does not. Yet, chemical and physical weathering often go hand in hand. For example, cracks exploited by mechanical weathering will increase the surface area exposed to chemical action. Furthermore, the chemical action at minerals in cracks can assist the physical disintegration process. The breakdown products following chemical weathering of rock and sediment minerals, and the leaching out of the more soluble parts, can be combined with decaying organic material to constitute soil. The mineral content of the soil is determined by the parent material (or bedrock) from which the minerals are derived. A soil derived from a single rock type is often deficient in one or more minerals for good fertility, while a soil weathered from a mix of rock types is often more fertile. Mechanical weathering leads to the disintegration of rocks and wood. It usually produces smaller, angular fragments of material with the same properties as the original parent material (such as scree). Thermal expansion—also known as onion-skin weathering, exfoliation, or thermal shock—is caused mainly by changes in temperature. It often occurs in hot areas such as deserts, where there is a large diurnal temperature range. The temperatures soar high in the day, while dipping to a few negative degrees at night. As the rock heats up and expands by day and cools and contracts by night, its outer layers undergo stress. As a result, the rock's outer layers peel off in thin sheets. Thermal expansion is enhanced by the presence of moisture. 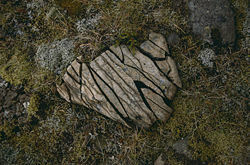 A rock in southern Iceland fragmented by freeze-thaw action. Frost-induced weathering, although often attributed to the expansion of freezing water captured in cracks, is generally independent of the water-to-ice expansion. It has long been known that moist soils expand (or "frost heave") upon freezing, as a result of the growth of ice lenses—water migrates from unfrozen areas via thin films to collect at growing ice lenses. This same phenomenon occurs within pore spaces of rocks. They grow larger as they attract water that has not frozen from the surrounding pores. The development of ice crystals weakens the rock, which, in time, breaks up. Intermolecular forces between the mineral surfaces, ice, and water sustain these unfrozen films which transport moisture and generate pressure between mineral surfaces as the lenses aggregate. Experiments show that porous rocks such as chalk, sandstone, and limestone do not fracture at the nominal freezing temperature of water of slightly below 0 °C, even when cycled or held at low temperatures for extended periods, as one would expect if weathering resulted from the expansion of water upon freezing. For the more porous types of rocks, the temperature range critical for rapid, ice-lens-induced fracture is -3 to -6°C, significantly below freezing temperatures. Freeze-induced weathering action occurs mainly in environments where there is a lot of moisture, and temperatures frequently fluctuate above and below freezing point—that is, mainly alpine and periglacial areas. This process can be seen in Dartmoor, a southwest region of England, where it results in the formation of exposed granite hilltops, or tors. Formerly believed to be the dominant mode, frost wedging may still be a factor in the weathering of nonporous rock, although recent research has demonstrated it less important than previously thought. Frost wedging—sometimes known as ice crystal growth, ice wedging, or freeze-thaw—occurs when water in the cracks and joints of rocks freezes and expands. In the expansion, it was argued that expanding water can exert pressures up to 21 megapascals (MPa) (2100 kilogram-force/cm²) at −22 °C, and this pressure is often higher than the resistance of most rocks, causing the rock to shatter. When water that has entered the joints freezes, the expanding ice strains the walls of the joints and causes the joints to deepen and widen. This is because the volume of water expands by about ten percent when it freezes. When the ice thaws, water can flow further into the rock. Once the temperature drops below freezing and the water freezes again, the ice enlarges the joints further. Repeated freeze-thaw action weakens the rocks, which eventually break up along the joints into angular pieces. The angular rock fragments gather at the foot of the slope to form a talus slope (or scree slope). The splitting of rocks along the joints into blocks is called block disintegration. The blocks of rocks that are detached are of various shapes, depending on their mineral structure. In pressure release (also known as unloading), overlying materials (not necessarily rocks) are removed by erosion or other processes, causing the underlying rocks to expand and fracture parallel to the surface. The overlying material is often heavy and the underlying rocks experience high pressure under it, such as in a moving glacier. Pressure release may also cause exfoliation to occur. Intrusive igneous rocks (such as granite) are formed deep beneath the Earth's surface. They are under tremendous pressure because of the overlying rock material. When erosion removes the overlying rock material, these intrusive rocks are exposed and the pressure on them is released. As a response to the decrease in pressure, the underlying rocks then expand upward. The expansion sets up stresses which cause fractures parallel to the rock surface to form. Over time, sheets of rock break away from the exposed rocks along the fractures. Pressure release is also known as "exfoliation" or "sheeting." These processes result in batholiths and granite domes, as found in Dartmoor. Hydraulic action refers to the action of water, generally from powerful waves, rushing into cracks in the rockface. This process traps a layer of air at the bottom of the crack, compressing it and weakening the rock. When the wave retreats, the trapped air is suddenly released with explosive force. The explosive release of highly pressurized air cracks away fragments at the rockface and widens the crack, so that more air is trapped on the next wave. This progressive system of positive feedback can damage cliffs and cause rapid weathering. Salt crystallization, otherwise known as haloclasty, causes disintegration of rocks when saline solutions seep into cracks and joints in the rocks and evaporate, leaving salt crystals behind. These salt crystals expand as they are heated up, exerting pressure on the confining rock. Salt crystallization may also take place when solutions decompose rocks. For example, limestone and chalk form salt solutions of sodium sulfate or sodium carbonate, of which the moisture evaporates to form their respective salt crystals. Salts that have proved most effective in disintegrating rocks are sodium sulfate, magnesium sulfate, and calcium chloride. Some of these salts can expand up to three times or even more. Weathering by salt crystallization is normally associated with arid climates, where strong heating causes rapid evaporation, leading to the formation of salt crystals. 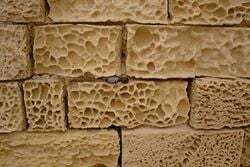 It is also common along coasts, and an example of salt weathering can be seen in the honeycombed stones in sea walls. Living organisms may contribute to mechanical weathering as well as chemical weathering (see 'biological' weathering below). Lichens and mosses grow on essentially bare rock surfaces and create a more humid chemical microenvironment. The attachment of these organisms to the rock surface enhances physical as well as chemical breakdown of the surface microlayer of the rock. On a larger scale, seedlings sprouting in a crevice and plant roots exert physical pressure and provide a pathway for water and chemical infiltration. Burrowing animals and insects disturb the soil layer adjacent to the bedrock surface, further increasing water and acid infiltration and exposure to oxidation processes. Another well-known example of animal-caused biotic weathering is by the bivalve mollusc known as a Piddock. These animals, found boring into carboniferous rocks (such as the limestone cliffs of Flamborough Head) bore themselves further into the cliff-face. Chemical weathering involves changes in the chemical composition of rock, often leading to breakdown in its form. In solution weathering, rock minerals are dissolved in water and the solubility is dependent on pH and temperature. Rainfall is naturally slightly acidic because atmospheric carbon dioxide dissolves in rainwater, producing weak carbonic acid. In unpolluted environments, the pH of rainfall is around 5.6. Acid rain occurs when gases such as sulfur dioxide and nitrogen oxides are present in the atmosphere. These oxides react in the rainwater to produce stronger acids and can lower the pH to 4.5 or even 4.0. Sulfur dioxide (SO2) from volcanic eruptions or fossil fuels can become sulfuric acid when exposed to rainwater, which can cause solution weathering of the rocks on which it falls. One of the most well-known solution weathering processes is carbonation, the process in which atmospheric carbon dioxide leads to solution weathering. Carbonation occurs on rocks that contain calcium carbonate, such as limestone and chalk. This takes place when rain combines with carbon dioxide or an organic acid to form a weak carbonic acid, which reacts with calcium carbonate (such as limestone) and forms calcium bicarbonate. This process speeds up with a decrease in temperature and therefore is a large feature of glacial weathering. Hydration is a form of chemical weathering that involves the strong attachment of H+ and OH- ions to the atoms and molecules of a mineral. For instance, the mineral anydrite forms the gypsum with the attachment of these ions during hydration. When rock minerals take up water, it increases in volume, thus setting up physical stresses within the rock. One example is found in iron oxides being converted to iron hydroxides. Hydration can lead to surface flaking, spalling, and pitting. A freshly broken rock shows differential chemical weathering (probably mostly oxidation) progressing inward. This piece of sandstone was found in glacial drift near Angelica, New York. This reaction results in complete dissolution of the original mineral, assuming enough water is available to drive the reaction. However, the above reaction is to a degree deceptive because pure water rarely acts as a H+ donor. Carbon dioxide, however, dissolves readily in water forming a weak acid and H+ donor. Aluminosilicates, when subjected to the hydrolysis reaction, produce a secondary mineral rather than simply releasing cations. The weathering process can involve chemical oxidation of a variety of metals. The most commonly observed is the oxidation of Fe2+ (iron) in combination with oxygen and water to form Fe3+ hydroxides and oxides such as goethite, limonite, and hematite. The affected rocks get a reddish-brown coloration on the surface, which crumbles easily and weakens the rock. This process is better known as "rusting." The addition of sulfur dioxide to limestone produces gypsum (calcium sulfate), which is more soluble than calcium carbonate and is easily dissolved and washed away by subsequent rain. On areas of a building which are sheltered from rain, a gypsum crust may accumulate and trap soot particles derived from fossil fuel combustion. A number of plants and animals may promote chemical weathering through the release of acidic compounds. The most common form of biological weathering is the release of compounds (such as acids) secreted by trees, to break down elements such as aluminum and iron in the surrounding soil. These elements can be toxic and disruptive to plant growth if left alone. Once broken down, such elements are more easily washed away by rainwater, and extreme release of chelating compounds can easily affect surrounding rocks and soils by the leaching out of these elements from the soil, known as podsolisation. Buildings made of limestone are particularly susceptible to weathering. Also, weeds can sometimes germinate in the gutters of buildings where they have been brought by the wind. As they proceed to grow, they plant their roots in the building's core rock foundation, forcing their way farther down. This causes the rock to exfoliate over a long time, witnessing small fragments crumble away now and then. In addition, statues and ornamental features can be badly damaged by weathering, especially in areas severely affected by acid rain, caused by pollutants in the air. ↑ 1.0 1.1 J. B. Murton, R. Peterson, J.-C. Ozouf, Science, 314, 1127, 2006. ↑ 2.0 2.1 J. G. Dash, A. W. Rempel, J. S. Wettlaufer, Rev. Mod. Phys. 78, 695, 2006. ↑ "Water expansion after frozen" Ask a Scientist: Environmental Science Archive. Newton. Dec 2004. Retrieved March 7, 2008. ↑ David McConnell, "Weathering and Soils: Physical Weathering" Good Earth, Sept. 09, 2001. Retrieved March 7, 2008. ↑ "Weathering" Retrieved March 7, 2008. Gore, Pamela J.W. 1998-2004. "Weathering of Rocks and Formation of Sediment" Georgia Perimeter College. Retrieved March 7, 2008. McConnell, David. 2001. "Weathering and Soils" The Good Earth. Retrieved March 7, 2008. Pidwirney, Michael. 1999-2006. "Introduction to the Lithosphere: Weathering" Physical Geography.net. Retrieved March 7, 2008. This page was last modified on 29 August 2008, at 16:05.